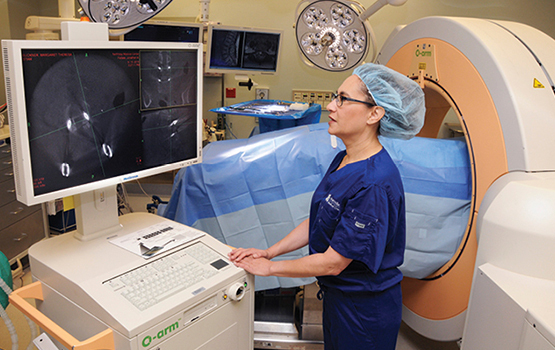 Dr. Edie Zusman is able to use the O-arm/Interoperative CT and Stealth Image Guidance system (the pale orange and white piece of equipment behind her) to perform complex spinal surgeries. 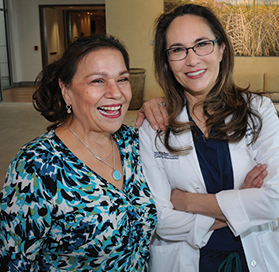 Marge Buckner of Vacaville had tried just about every possible approach to ending unbearable back pain when she met neurosurgeon Edie Zusman, M.D., in 2016. Marge’s troubles began almost a decade earlier, with an ice skating injury that led to numerous surgeries, treatments and procedures. Although each action provided some relief, headaches, leg pain and back pain persisted. Marge remembers one particular X-ray that Dr. Zusman ordered. The position she had to strike was memorable, she said, and it turned out to be worthwhile. Marge had a condition called spondylolisthesis and needed a minimally invasive spine fusion. Dr. Zusman and neurosurgical colleague Dr. Jonathan Forbes made two 1.5-inch incisions on either side of Marge’s spine and operated through small tubes under an operating microscope, using the “O-arm/Intraoperative CT and Stealth Image Guidance” to place pins down the long shaft of the bone, and rods to hold them in place. She was able to clean out the disc space and decompress the pinched nerve roots, placing a spacer, or cage, in the disc space to re-establish its normal height. “If we had just looked at the MRI images, the abnormality would not have been visible. But we looked at the patient,” said Dr. Zusman. Marge Buckner of Vacaville is thrilled to be mobile again, after a spinal fusion by Dr. Edie Zusman took away her pain and returned her ability to move. When Marge took her first steps after surgery, she was stunned. “It was gone. My pain was GONE!” she exclaimed. Today she can walk a block or more without her legs giving out. She’s thrilled to be able to participate in water therapy at NorthBay Health-Spring Fitness, where therapist Bob Blackwell keeps a close eye on her progress. Some days, Marge admits she pushes a little too hard. She’s learning where to draw her line in the sand.